Stimulated CD4+ T lymphocytes can differentiate into effector T cell (Teff) or inducible regulatory T cell (Treg) subsets with specific immunological roles. We show that Teff and Treg require distinct metabolic programs to support these functions. Th1, Th2, and Th17 cells expressed high surface levels of the glucose transporter Glut1 and were highly glycolytic. Treg, in contrast, expressed low levels of Glut1 and had high lipid oxidation rates. Consistent with glycolysis and lipid oxidation promoting Teff and Treg, respectively, Teff were selectively increased in Glut1 transgenic mice and reliant on glucose metabolism, whereas Treg had activated AMP-activated protein kinase and were dependent on lipid oxidation. Importantly, AMP-activated protein kinase stimulation was sufficient to decrease Glut1 and increase Treg generation in an asthma model. These data demonstrate that CD4+ T cell subsets require distinct metabolic programs that can be manipulated in vivo to control Treg and Teff development in inflammatory diseases. The balance between protective immunity and suppression of inappropriate inflammation requires that CD4+ T cells properly activate and differentiate into effector or regulatory subsets (1). However, cell growth and function require sufficient energy generation and biosynthesis (2, 3). To meet these requirements, activated T cells decrease lipid oxidation and undergo a rapid increase in glycolysis (4). At the conclusion of an immune response, decreased glycolysis and increased lipid oxidation can favor the enrichment of long-lived CD8+ memory cells (5, 6). For CD4+ T cells, however, it has been unclear how metabolism may support effector T cells (Teff) Th1, Th2, and Th17 and inducible regulatory T cells (Treg). The mammalian target of rapamycin (mTOR) and AMP-activated protein kinase (AMPK) pathways play important and opposing roles in metabolism and immunity. T cell activation stimulates mTOR to increase glycolysis and diminish lipid oxidation (7). This pathway is also essential for CD4+ T cell subset differentiation, as mTOR-deficient mice generate Treg, but are severely inhibited in the differentiation of the Teff subsets (8, 9). In contrast, the AMPK pathway acts to inhibit mTOR by suppressing mTOR signaling and to promote mitochondrial oxidative metabolism rather than glycolysis (10). Although AMPK activation can be anti-inflammatory (11), its role in T cell metabolism and CD4+ T cell subset differentiation is uncertain. In this study, we demonstrate that cell metabolism is critical to regulate CD4+ T cell fate. Direct manipulation of cell metabolism showed that distinct metabolic programs were essential for the survival and specification of Teff and Treg, as Teffs required a glycolytic metabolism with active mTOR, whereas Treg had high levels of activated AMPK and required lipid oxidation. Mice were C57BL/6J and 6–8-wk-old unless indicated. Glut1 transgenic mice were previously described (3). Glut1-myc mice were generated by insertion of a tandem myc tag into exon 3 of Glut1 that encodes an extracellular loop and homologous recombination of this myc-tagged exon into the endogenous Glut1 locus (Slc2a1). Embryonic stem cell clones with gene-targeted Glut1-myc were screened by PCR and used in blastocyst injection to generate mice in which Glut1-myc was expressed and regulated at endogenous levels to allow sensitive staining for endogenous surface Glut1. CD4+ T cells and Tregs were isolated ex vivo (Miltenyi Microbead; Miltenyi Biotec) and cultured in RPMI 1640 (Mediatech) supplemented with 10% FBS (Gemini Bio-Products). Oleate/palmitate (Sigma-Aldrich) were mixed with BSA (Sigma-Aldrich) and used at 1 mM. Etomoxir (Etx; Sigma-Aldrich) was used at 200 μM. Th cell subsets were generated as described (12). Unless indicated, CD4+ T cells were stimulated on coated plates (10 μg/ml anti-CD3 and anti-CD28) or on irradiated splenic feeder cells (3000 rad) with 2.5 μg/ml anti-CD3 Ab at a ratio of 5:1. CD4+ subsets were generated by culture under the following conditions: Th1, IL-12 (10 ng/ml; R&D Systems), and anti–IL-4 (10 μg/ml; clone 11B11); Th2, IL-4 (1000 U/ml; R&D Systems), and anti–IL-12 (10 μg/ml; clone C17.8); Th17, TGF-β (2 ng/ml), IL-6 (20 ng/ml; R&D Systems); and Treg, TGF-β (2 ng/ml). On day 3 poststimulation, cells were split 1:2, washed, and replated with IL-2 alone for an additional 2 d. In indicated experiments, fatty acid (FA) was added during CD4+ T cell differentiation or on day 2 post–IL-2 addition and cultured for 2 additional days for a total of 7 d. For glucose-deprivation, Th17 and Tregs were generated in dialyzed serum in the presence or absence of 5 mM glucose. The following Abs were used: rat anti-mouse CD4-FITC, CD4-allophycocyanin, CD44-PE, CD44-Pacific Blue, T-bet–PE, GATA3-PE, retinoic acid-related orphan receptor γt-allophycocyanin, and Foxp3-PE (eBioscience). To measure intracellular cytokines, cells were unstimulated or stimulated for 5 h with PMA (50 ng/ml; Sigma-Aldrich) and ionomycin (750 ng/ml; Calbiochem) in the presence of GolgiPlug (IL-2, IFN-γ, IL-17) or GolgiStop (IL-4 and IL-17), permeabilized using Cytofix/Cytoperm Plus (BD Biosciences), and stained with appropriate Abs. Cell-surface Glut1 expression in each CD4+ T cell subset was determined using Glut1-myc T cells by surface staining with anti-Myc Ab followed by fixation and intracellular staining for cytokines or Foxp3 to identify committed cells. In parallel cultures, the percentages of live cells were determined by 1 μg/ml propidium iodide (Invitrogen) exclusion, and cytokine-producing cells were determined by FACS analysis. The number of viable cytokine-producing cells was calculated by (1 × 106 cells in each culture) × (% viable) × (% cytokine+). Treg were differentiated as described above and cultured 1:1 with CFSE-labeled CD4+ T cells on plates coated with 5 μg anti-CD3 and anti-CD28. Treg suppression of CD4+ T cell proliferation was determined 72 h poststimulation by CFSE dilution. Glucose uptake, glycolysis, and lipid oxidation were measured as previously described (5, 7, 13). Mitochondrial membrane potential was determined by staining cells in 200 nM tetramethylrhodamine ethyl ester (Invitrogen) followed by FACS analysis. Glut1 expression was measured as previously described (7). For other proteins, cells were lysed in RIPA buffer with protease and phosphate inhibitors (Sigma-Aldrich) and an immunoblot with mouse anti-actin (Sigma-Aldrich), rabbit anti-AMPK (Cell Signaling Technology), and rabbit anti–phospho-AMPK (Cell Signaling Technology) Ab. A murine model of asthma was used with OVA sensitization and subsequent aerosol challenge (14). Mice were injected daily with PBS or metformin (Met; Sigma-Aldrich) (250 mg/kg) as previously described (5). Data were analyzed using a two-tailed Student t test, and p ≤ 0.05 was considered significant. The distinct functional requirement of CD4+ Th cells suggests that each subset may require specific metabolic programs to meet their differing energetic and biosynthetic demands. To examine the metabolic profile of differentiated CD4+ T cells, naive CD4+ T cells were stimulated to replicate Teff (Th1, Th2, or Th17) and inducible Treg culture conditions (Supplemental Fig. 1A) (12). After 3 d of culture in appropriate conditions, cells were washed and replated for an additional 2 d in IL-2 alone. The glucose transporter, Glut1, is strongly induced and traffics to the cell surface upon T cell activation to promote glycolytic metabolism and T cell growth (3). We examined total expression of Glut1 in wild-type mice and surface expression of Glut1 using a myc-epitope tagged Glut1 from mice in which a myc tag had been homologously recombined into the endogenous glut1 locus to allow sensitive flow cytometry for endogenous surface Glut1. Both total and cell-surface Glut1 increased between cells stimulated in Treg and Teff conditions, as Treg conditions led to low surface and total Glut1 (Fig. 1A, 1B). Additionally, glucose uptake (Supplemental Fig. 1B) and glycolysis (Fig. 1C) were increased in CD4+ T cells cultured under Teff compared with Treg culture conditions. T cells stimulated under Treg conditions were not, however, metabolically inactive, as these cells exhibited increased mitochondrial membrane potential (Fig. 1D), oxidized lipids at a higher rate than cells under conditions favoring other CD4+ subsets (Fig. 1E), and exhibited elevated glucose metabolism compared with naive T cells (Fig. 1C, Supplemental Fig. 1C). Thus, differentiated CD4+ T cell subsets use distinct metabolic programs, with Th1, Th2, and Th17 cells being primarily glycolytic, whereas Treg primarily use lipid metabolism. Teff and Treg CD4+ T cell subsets exhibit distinct metabolic profiles. CD4+ T cells from wild-type (A, C–E) or Glut1-myc (B) knockin mice were cultured to enrich Teff (Th1, Th2, Th17) and Treg subsets. After 3 d, cells were washed and cultured 2 d in IL-2 alone and analyzed by immunoblot (A), surface staining of endogenous Glut1-myc (B) with anti-Myc Ab followed by gating on each T cell subset as determined by intracellular cytokine staining, glycolysis (C), mitochondrial potential by tetramethylrhodamine ethyl ester staining (D), and palmitate oxidation (E). Naive CD4+ T cells or cells activated in the presence of the CPTI inhibitor Etx are shown as controls. F, Percentage of splenic cytokine+ CD4+ T cells from >1 y aged Glut1 transgenic (n = 6) and nontransgenic (n = 5) mice following stimulation intracellular cytokine staining for IFN-γ, IL-4, and IL-17. The percentage of Foxp3+ cells was assessed ex vivo by intracellular staining. Results are from three independent experiments with average and SD determined using the Student t test. *p ≤ 0.05. Because CD4+ T cells grown under Teff conditions exhibited elevated Glut1 expression (Fig. 1A, 1B), and transgenic expression of Glut1 can enhance T cell proliferation and cytokine production (3), glucose uptake may specifically promote Teff generation or function. To determine if increased glucose metabolism favored Teff generation, we examined aged Glut1 transgenic mice. Transgenic CD4+ T cells had increased Glut1 expression and basal glucose uptake (Supplemental Fig. 1D, 1E) that correlated with accumulation of activated/memory CD4+ CD44high T cells in the spleen, lymph node, and liver with age (Supplemental Fig. 1F). In addition, aged Glut1 transgenic mice had increased anti-dsDNA Abs in the serum (Supplemental Fig. 1G) and Ig deposition in the kidneys (3). Importantly, single-cell analysis revealed that stimulated Glut1 transgenic CD4+ T cells had significantly elevated production of the cytokines IFN-γ, IL-4, and IL-17 (Fig. 1F, Supplemental Fig. 1H), reflecting an enrichment of Th1, Th2, and Th17 (Teff) CD4+ T cell subsets, respectively. In contrast, the percentage of Foxp3+ Treg in the spleen (Fig. 1F, Supplemental Fig. 1H) and thymus (Supplemental Fig. 1I) was similar regardless of Glut1 expression. The distinct metabolic phenotypes of Teff and Treg cultures and the selective increase in Teff in aged Glut1 transgenic mice suggested that Teff in particular are sensitive to glucose levels and may have an increased glucose dependency compared with Treg. Consistent with this notion, differentiation of CD4+ T cells in media lacking glucose failed to yield Th17 cells, whereas Treg differentiation remained largely intact (Supplemental Fig. 1J). Thus, Teff exhibit elevated levels of glucose metabolism that are selectively required for their generation. Rather than glucose metabolism, Treg differentiation may have relied on an alternate metabolic fuel. Elevated lipid oxidation (Fig. 1E) suggested this pathway may provide an important energy source. To determine if lipid oxidation was required for Treg differentiation, T cells were activated and polarized toward the Th1, Th17, or Treg subtypes in the presence or absence of the carnitine palmitoyl-transferase-1 inhibitor Etx to block mitochondrial lipid uptake and oxidation. Although treatment with Etx did not alter Teff differentiation, Treg generation was suppressed by blockade of carnitine palmitoyl-transferase-1 and lipid oxidation (Fig. 2A, Supplemental Fig. 1A), demonstrating a selective dependency of Treg on lipid metabolism. Lipid oxidation promotes Treg generation and suppresses Teff function and survival. A, CD4+ T cells were stimulated in conditions to enrich for Th1 cells and Treg in the presence or absence of Etx and assessed by intracellular cytokine and Foxp3 staining. CD4+ T cells were cultured in Teff and Treg skewing cultures in the presence or absence of exogenous FA, washed, and examined for function by intracellular cytokine staining or in a T cell suppressor assay (B) and expression of CD4+ lineage commitment transcription factors by flow cytometry (C). D, Th cell subsets were generated, washed, and replated an additional 2 d in IL-2 and a further 2 d in the presence or absence of FA in parallel wells to measure cell viability and cytokine production in each condition. The number of viable cytokine-producing cells was then calculated for each condition. Results are representative of three independent experiments with average and SD determined using the Student t test. *p ≤ 0.05. Exogenous FA were next added to CD4+ T cell cultures to promote lipid oxidation and determine the role of lipids in T cell differentiation or survival. Interestingly, addition of lipids during initial T cell activation strongly inhibited the production of Th1, Th2, and Th17 cytokines, but not Treg suppressive function under skewing conditions (Fig. 2B). Analysis of lineage-specific transcription factors revealed that Th1 differentiation was selectively reduced in the presence of FA compared with Th2 and Th17 cells, as FA prevented T-bet expression (Fig. 2C). Treg expression of Foxp3, however, was modestly increased by the addition of exogenous FA. This was not solely due to alteration of specific differentiation signals, as cytokine production by fully differentiated Th1, Th2, and Th17 cells was also strongly suppressed by lipid addition, whereas Treg were slightly increased (Supplemental Fig. 2B). Importantly, inhibition of Teff function in the presence of FA could not be rescued by readdition of Th1-, Th2-, and Th17-promoting cytokines (Supplemental Fig. 2C). This appeared due in part to regulation of cell survival, as addition of FA caused significant loss of viable cytokine-producing Th1, Th2, and Th17 cells, but not Treg (Fig. 2D). Thus, Teff require glucose metabolism and are selectively suppressed by FA oxidation, whereas lipid, not glucose, metabolism is essential for Treg generation. Inhibition of mTOR can result in the elevated oxidation of exogenous FA (15) and promote Treg differentiation (16). To examine the role of lipid oxidation in the generation of Treg upon mTOR inhibition, CD4+ T cells were skewed toward the Treg lineage in the presence or absence of rapamycin alone to block mTORC1 function or with Etx to inhibit lipid oxidation. Both rapamycin alone and FA addition resulted in an increased percentage of Treg that was enhanced in the presence of TGF-β (Fig. 3A). In contrast, Etx prevented rapamycin and TGF-β–induced Treg generation, indicating that Treg development upon mTOR inhibition requires lipid oxidation. AMPK and mTOR regulate lipid oxidation and enrich Treg differentiation in vivo. A, CD4+ T cells were stimulated with anti-CD3 and anti-CD28 for 18 h, washed, and replated in the presence of anti-CD3 alone, 25 nM rapamycin (Rapa), 2 ng/ml TGFβ, 200 μM Etx, or 10 mM FA for an additional 48 h followed by intracellular Foxp3 staining. B, Immunoblot of Th cultures, naive CD4+ T cells, and natural Tregs. C–E, Mice were sensitized to OVA in the presence of Met or a PBS followed by aerosol challenge 21 d later and analyzed by intracellular Glut1 staining in CD4+ CD44lowT cells (solid gray) and CD4+ CD44high T cells in the draining lymph node of the lung from mice treated with (black line) or without (gray line) Met (C). In addition, the percentage (D) and number (E) of CD4+ Foxp3+ cells and total CD4+ T cells in the draining lymph node following aerosol challenge were determined. Results are representative of three independent experiments with average and SD determined using the Student t test. *p ≤ 0.05. Inhibition of mTOR by rapamycin and activation of AMPK by Met resulted in increased lipid oxidation following CD4+ T cell stimulation (Supplemental Fig. 2D, 2E). Interestingly, both natural and inducible Treg exhibited elevated levels of AMPK phosphorylation and activation compared with Teff and naive CD4+ T cells (Fig. 3B). To determine if AMPK activation could increase Treg generation in vivo, the AMPK activator Met was administered, and the frequency of Treg generation was assessed in a murine model of allergic asthma, an inflammatory disease regulated in part by Treg frequency (17). Activated CD4+ T cells from Met-treated animals had lower expression of Glut1 than activated cells from untreated mice, suggesting reduced glycolysis (Fig. 3C). Importantly, Met decreased the total T cell numbers in the draining lymph nodes, but significantly increased the percentage and number of Treg (Fig. 3D, 3E). Furthermore, there was a significant reduction in lymphocytes recovered from the bronchial alveolar lavage following Met treatment (Supplemental Fig. 2F). Although airway responsiveness itself was not significantly affected, these results demonstrate that targeting T cell metabolism to promote lipid oxidation can preferentially enrich Treg in vivo. In summary, we have used direct metabolic measurements and manipulations to show that CD4+ Teff and Treg use and require specific metabolic programs that affect T cell fate both in vitro and in vivo. The mTOR and AMPK signaling axis has been shown previously to regulate both metabolism and differentiation of CD4+ T cells into Teff or Treg pathways (8, 9). Connections between metabolism and differentiation, however, have been unclear. Our data show that metabolism is a fundamental determinant of cell fate and that the metabolic program must match the T cell subset for cell survival and differentiation. This requirement of Teff for glycolytic metabolism and Treg for lipid oxidation may underlie the mechanism by which mTOR regulates Teff and Treg lineages and allowed increased Treg generation in asthma by AMPK activation (Supplemental Fig. 2G). Similar to the distinct metabolic programs of Treg and Teff, CD8+ memory T cells are associated with lipid oxidation and are long-lived, whereas CD8+ effectors are glycolytic and highly proliferative (5, 6), indicating specific metabolic programs may be critical in multiple aspects of immune cell fate. 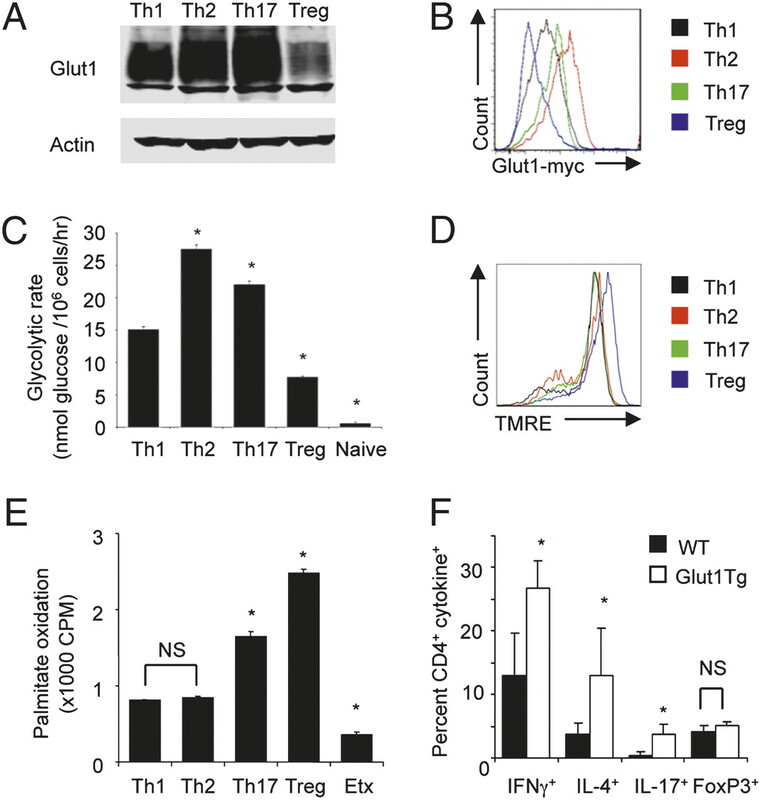 Treg can maintain a stable pool of important immune regulatory cells (18), and lipid oxidation may be central in contributing to their maintenance and self-renewal. Ultimately, targeting cell metabolism may provide a new direction to stimulate immunity by promoting glycolytic metabolism characteristic of Teff or to suppress immunity and inflammation by promoting lipid oxidation characteristic of Treg. We thank Drs. Anthony Means and Christopher Newgard and the University of California, San Francisco (San Francisco, CA) Mouse Airway Physiology Core. Glut1-myc knockin mice were generated with the Duke University Transgenic Animal Facility. This work was supported by National Institutes of Health Grant R01 AI063345 (to J.C.R. ), the American Asthma Foundation (J.C.R. is a Bernard Osher Fellow of the American Asthma Foundation), the Leukemia and Lymphoma Society (to J.C.R. ), the Lupus Research Institute (to J.C.R. ), and an Irvington Institute postdoctoral fellowship from the Cancer Research Institute (to R.D.M.).
. 2005. Regulation of immunity by self-reactive T cells. Nature 435: 598–604.
. 2005. Glucose availability regulates IFN-gamma production and p70S6 kinase activation in CD8+ effector T cells. J. Immunol. 174: 4670–4677.
. 2008. Glucose uptake is limiting in T cell activation and requires CD28-mediated Akt-dependent and independent pathways. J. Immunol. 180: 4476–4486.
. 2008. The biology of cancer: metabolic reprogramming fuels cell growth and proliferation. Cell Metab. 7: 11–20.
. 2007. Cytokine stimulation promotes glucose uptake via phosphatidylinositol-3 kinase/Akt regulation of Glut1 activity and trafficking. Mol. Biol. Cell 18: 1437–1446.
. 2010. Mammalian target of rapamycin protein complex 2 regulates differentiation of Th1 and Th2 cell subsets via distinct signaling pathways. Immunity 32: 743–753.
. 2006. AMP-activated protein kinase—development of the energy sensor concept. J. Physiol. 574: 7–15.
. 2009. Metformin attenuated the autoimmune disease of the central nervous system in animal models of multiple sclerosis. [Published erratum appears in 2009 J. Immunol. 183: 3551.] J. Immunol. 182: 8005–8014.
. 2007. The transcription factor HIF-1alpha plays a critical role in the growth factor-dependent regulation of both aerobic and anaerobic glycolysis. Genes Dev. 21: 1037–1049.
. 2010. Both hematopoietic-derived and non-hematopoietic-derived β-arrestin-2 regulates murine allergic airway disease. Am. J. Respir. Cell Mol. Biol. 43: 269–275.
. 2007. The mammalian target of rapamycin regulates lipid metabolism in primary cultures of rat hepatocytes. Metabolism 56: 1500–1507.
. 2008. The AKT-mTOR axis regulates de novo differentiation of CD4+Foxp3+ cells. J. Exp. Med. 205: 565–574.
. 2005. CD4+CD25+ T cells protect against experimentally induced asthma and alter pulmonary dendritic cell phenotype and function. J. Exp. Med. 202: 1549–1561.